Le Lacheur's pre-war garage in Guernsey. Homepage. This page: A scan of a pre-war statement issued by Le Lacheur's Garage, of Rouge Huis Avenue in Guernsey. Le Lacheur's Garage for Chevrolet, Chrysler and Dodge. 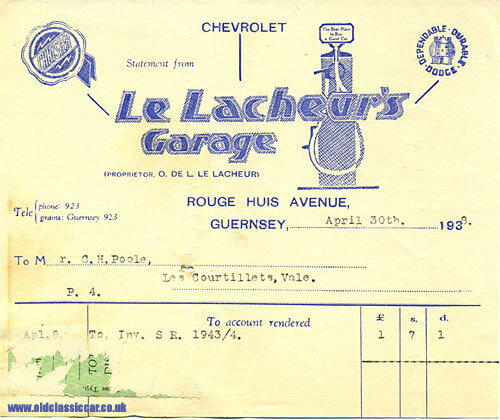 On April 30th 1938 this statement was typed out at Le Lacheur's Garage, ready to be sent to a Mr C.H. Poole of Les Courtillets, Vale, for the sum of £1 7s 1d. Quite what this sum was for isn't known. The garage was an appointed dealer in Chevrolet, Chrysler and "Dependable Durable" Dodge vehicles, which, according the writing on the petrol pump globe shown below, was "The Best Place to Buy a Good Car". At this time, the business was located on Roger Huis Avenue, in the Saint Peter Port area of Guernsey, although in 1938 it would move to a new location. The firm first opened for business on 7th October 1923, and in 1954 was re-named Doyle Motors which continues to this day. As well as the aforementioned American marques, the garage also dealt in Peugeots and more recently, Hondas. At one time it was also a Rover-appointed garage, and became famous locally in 1948 for selling the first Rolls-Royce on the island. Just over two years after this statement was typed, the island would be occupied by the German forces, and life would never be the same again for the islanders who lived there. One person's recollections of living on Guernsey during the Occupation can be found on the WW2 People's War section of the BBC's website. Another early item of paperwork relating to a motor business on Guernsey, Robilliard & Son's petrol station, can be seen here, as can a receipt issued by the Vale Avenue Motor Works in 1934.